"Russia is viable as a nation-state. I don't think, however, that it has much of a future as an empire. I don't think the Russians can reestablish their empire. If they're stupid enough to try, they'll get themselves into conflicts that will make Chechnya and Afghanistan look like a picnic." Zbigniew Brzezinski, former National Security Advisor to President Jimmy Carter (1977-1981), in an interview with Open Media Research Institute, published in "Transition" (November 15, 1996). "There is also a risk, however, that for many young people, independence is something that can be taken for granted. One should always remember that independence is a condition that is derived from one's own determination to be independent. And those who have earned their freedom may be more conscious of it than those who are born into freedom, who may take independence and freedom for granted as the normal state of affairs. Unfortunately, the world we live in is not like that. There are very few countries that are wholly secure in their independence. It is particularly the younger people - members of the academic community - who will be shaping the destiny of this country in the years to come. One should always remember that this freedom depends upon the genuine, enduring, deep, and uncompromising commitment to one's country." 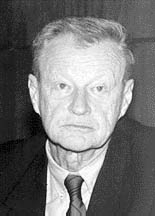 Zbigniew Brzezinski (b. 1928) on the occasion of being awarded an Honorary Doctorate at Baku State University on November 7, 2003. Dr. Brzezinski served as National Security Advisor to President Jimmy Carter from 1977 to 1981. From Azerbaijan International (11.4) Winter 2003.